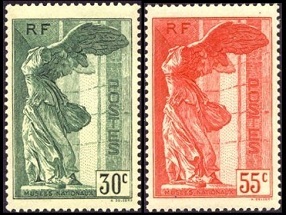 Surtaxed French stamps, at the end of 1935, returned to their originally intended purpose of collecting funds for public charities. The two pictorial stamps shown above (Y&T #309, #352, Sc. #B44-45) were issued during 1936 and 1937. The surtax on these stamps was for the aid of political refugees. 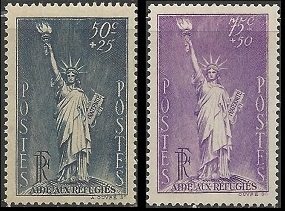 The design of both these stamps features the Statue of Liberty. 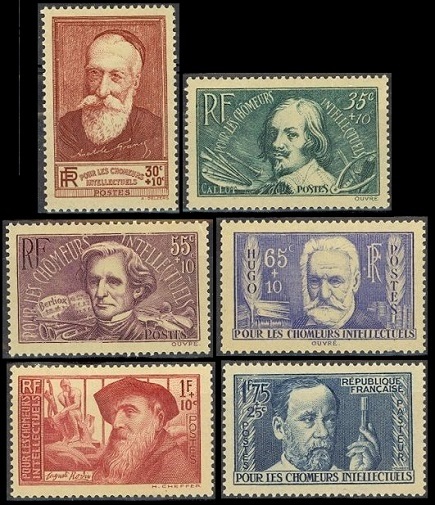 The six pictorial stamps shown above (Y&T #330-33, #343-44, Sc. #B48-53) were issued during 1936 and 1937. The surtax on these stamps was used for the relief of unemployed intellectuals. 20 C. + 10 C. (1936) - Jacques Callot (1592-1635), French Baroque printmaker and draftsman. 30 C. + 10 C. (1937) - Anatole France (1844-1924), French poet, journalist, and novelist. 40 C. + 10 C. (1936) - Hector Berlioz (1803-1869), French Romantic composer. 50 C. + 10 C. (1936) - Victor Hugo (1802-1885), French Romantic poet, novelist, and dramatist. 90 C. + 10 C. (1937) - Auguste Rodin (1840-1917), French sculptor. 1.50 F. + 50 C. (1936) - Louis Pasteur (1822-1895), French chemist and microbiologist. 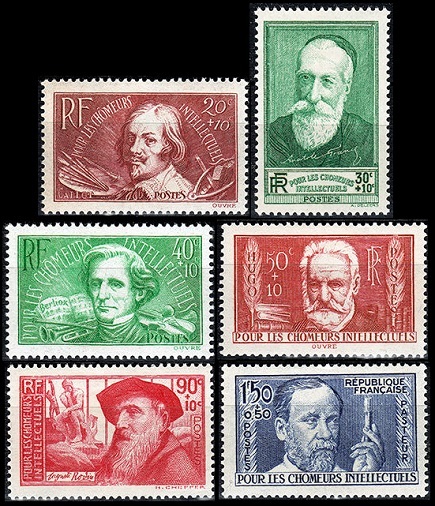 The intellectuals set of 1936-1937 was re-issued during 1938. They are all shown above (Y&T #380-85, Sc. #B54-59). The designs are exactly the same, but the denominations and / or colors of the re-issued stamps are different. The three pictorial stamps shown above (Y&T #345-47, Sc. #B60-62) were issued on June 16, 1937. The surtax on these stamps was used for the recreation fund for Post, Telephone, and Telegraph workers. 20 C. + 10 C. (1937) - Tug of war. 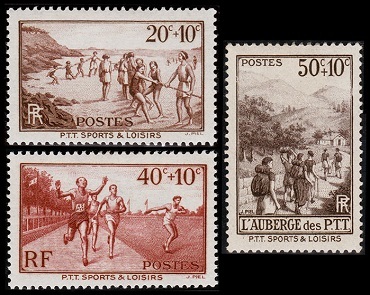 40 C. + 10 C. (1937) - Foot race. 50 C. + 10 C. (1937) - Hiking. The two pictorial stamps shown above (Y&T #356, #419, Sc. #B64-65) were issued in 1937 and in 1939. The surtax on these stamps was for public health charities. The design of both these stamps features "France" holding an infant. 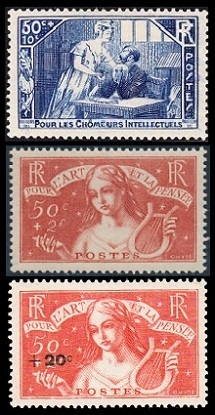 The two pictorial French stamps shown above (Y&T #354-55, Sc. #B66-67) were issued during August 1937. The surtax on these stamps was for the Louvre Museum. The design of both these stamps features the Winged Victory of Samothrace in the Louvre Museum. The Winged Victory of Samothrace is a 2nd Century BC marble sculpture of the Greek goddess Nike, attributed to Pythokritos of Rhodes. The statue was first discovered in 1863, and it has been in the Louvre Museum since 1884. The two pictorial stamps shown at the top of the image above (Y&T #307-08, Sc. #B42-43) were issued on December 9, 1935. The surtax on these stamps was for the aid of distressed and exiled intellectuals. The 50 C. + 10 C. denomination stamp features "France" Giving Aid to an Intellectual. The 50 C. + 2.00 F. denomination stamp features a young French woman, being symbolic of music. The surcharged stamp shown above (Y&T #329, Sc. #B47), at the bottom of the image, was issued in November 1936, indicating that the surtax was 20 C., instead of 2.00 F.
The pictorial stamp shown above (Y&T #312, Sc. #B46) was issued in May 1936. The surtax on these stamps was for aid to the children of the unemployed. The design of this stamp features a symbolic representation of the children of the unemployed. The pictorial stamp shown above (Y&T #353, Sc. #B63) was issued in August 1937. The surtax on these stamps was for the Pierre Loti Monument Fund. Pierre Loti (1850-1923), pictured on the stamp above, was a French naval officer, famous for the exotic novels he wrote about his travels.